Threadening, parlour, eyebrows, upperlips...all these words make me feel nervous .. Personally I don't like visit salon in every 10-15 days and waiting in a long queue... Sometimes it feels so annoying to waste so much time.. More over being a mom of a kid, I only get time for all these in weekends when my husband take care of him and seriously I don't want to spoil my weekend at the parlour by waiting for a long time... It is not my story, it is the story of every mother or lady.. 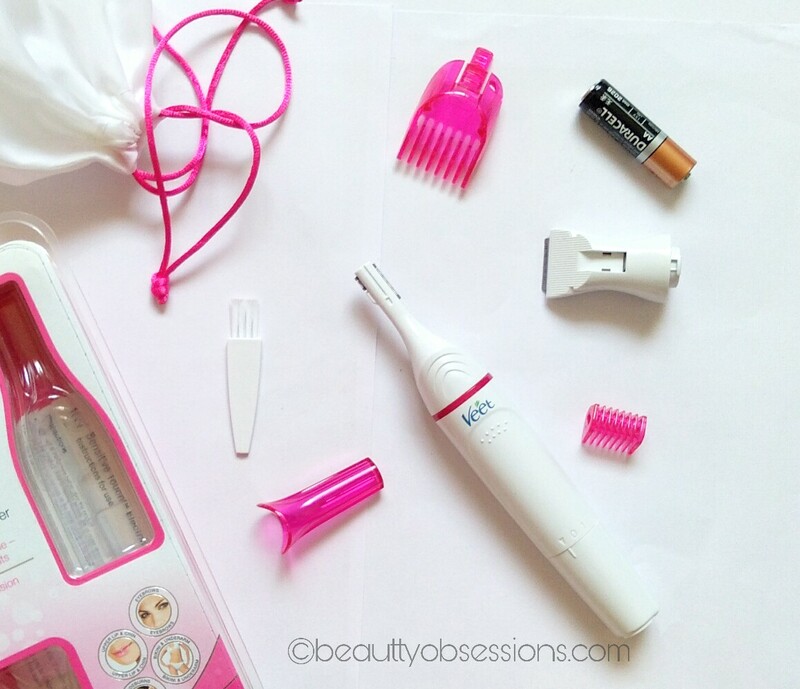 I always wanted to do my threadening and waxing at home by myself but not in the typical painful way... I have my epilator which works as an alternate of waxing... But I wanted to get something for my brows especially... 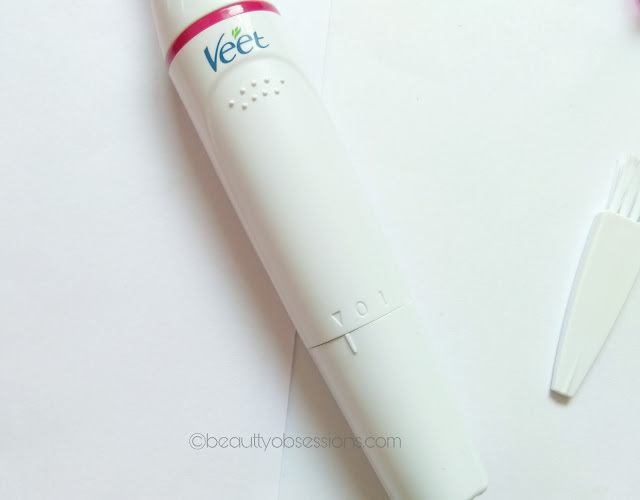 When I saw the Veet Sensitive Touch Electric Trimmer advertisement on TV, I immediately decided to get it... Then I searched for reviews on YouTube and there were few positive thoughts and some negative thoughts as well.. Hence after thinking a lot, I got mine from Amazon and it was on sale that time... I bought the trimmer for Rs1739/- while the actual price is Rs2250/-. 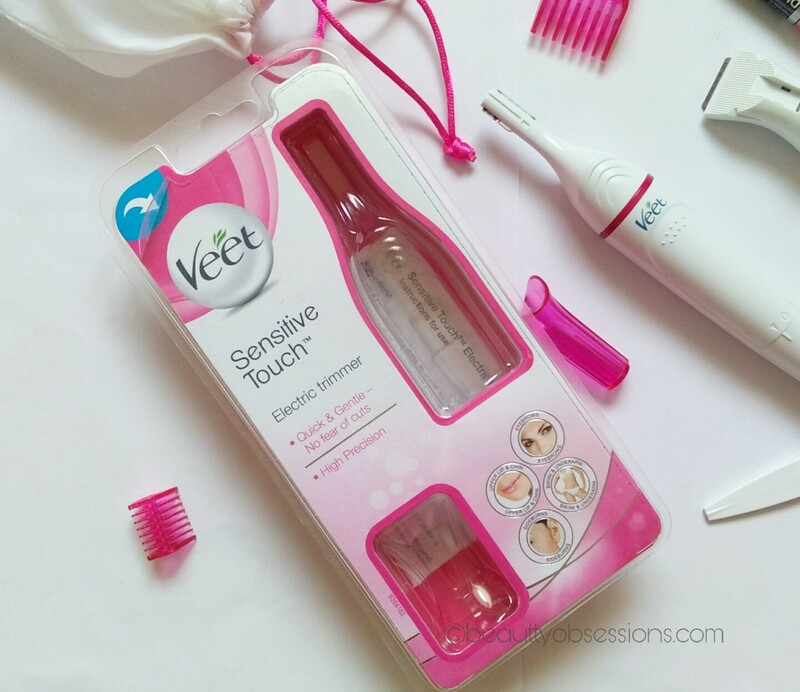 PACKAGING - The Veet sensitive touch trimmer set comes in sturdy plastic packaging which has total eight products... The kit has one beauty styler , one double sided trimming head for eyebrow shaping, one bikini trimmer, two comb attachments, one cute looking cap, one brush to clean, one AA battery, one storage pouch.. 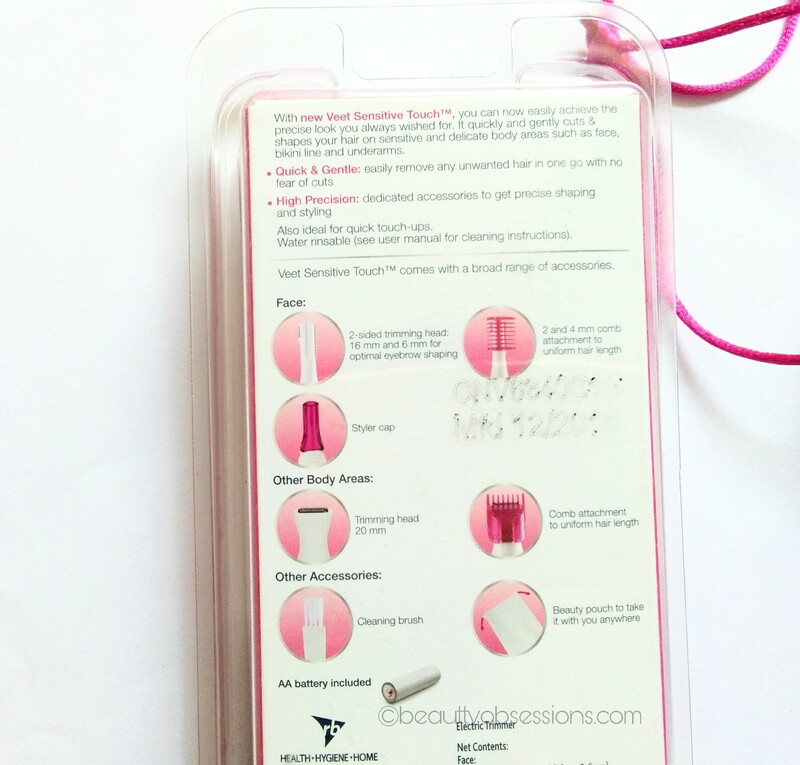 There is also a manual slip which has all information regarding the product ..
First you have to open the lower portion by twisting left and insert the battery and close the portion again by twisting right to the mark '0' ... There are three marks on the lower part and by twisting to the mark '1' , the trimmer will start... Isn't it easy ? For shaping brows, first put the small comb head and move the timmer with the direction of hair growth. 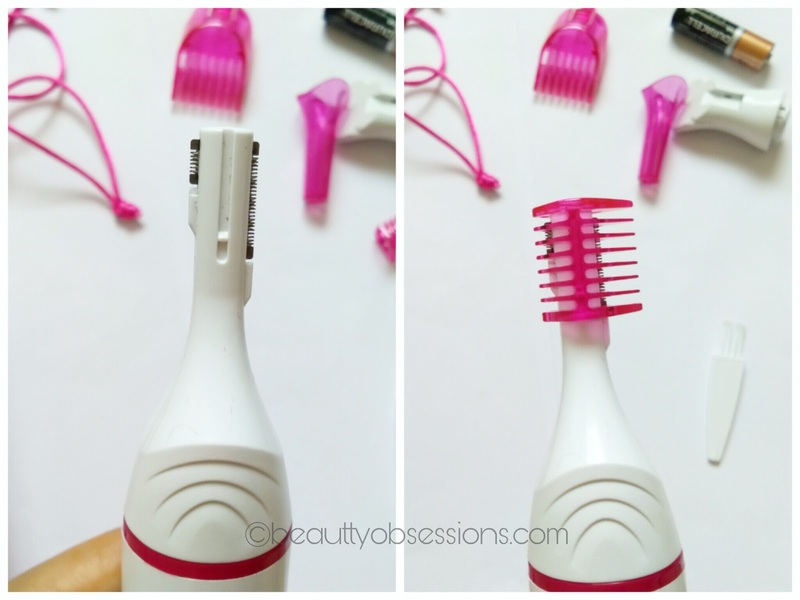 It will cut the extra length of eyebrow hair. Then hold the small blade vertically and started trimming against the hair growth... To be very honest, don't expect that perfect finish which threadening gives but nothing is far better than something..
** Another suggestion is, first shape your eyebrow once at parlour before using it for the first time... In this way you will get a proper shape to trim further perfectly.. I use the wide blade side to trim forehead, upperlips and the whole face and it works beautifully... For underarms and bikini line use the other trimmer . 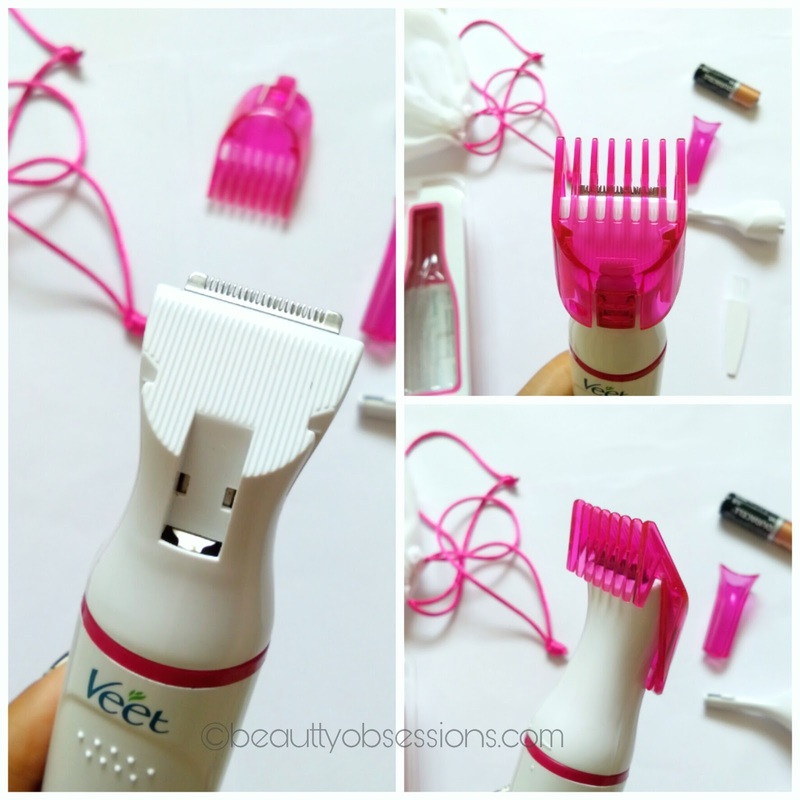 For changing the trimmer head, just twist the current head left (there is a arrow mark too) and put the other head and twist right... For my underarms, the trimmer works great... I love it... Moreover there is no pain and no fear of cutting as the blade doesn't touch the skin. I generally use this once a week for all the purpose and sometimes twice a week as per requirement. 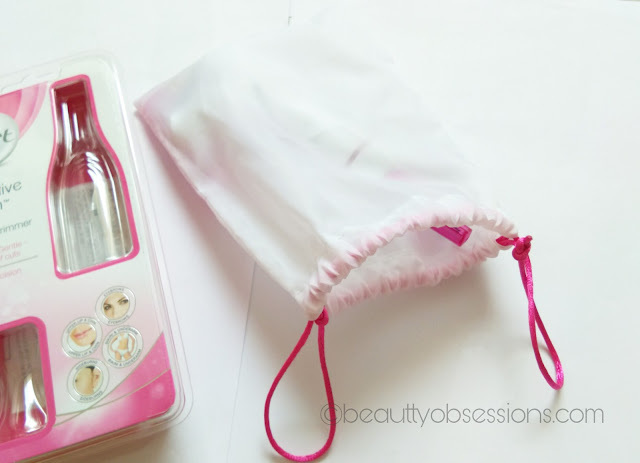 The pouch makes it so convenient to carry in purse while traveling... The beautiful cap makes it safe to carry.. Initially you may find it weird to use but after practicing few times, the process feels so easy... The only thing which makes me irritate while using is, its noise... The noise is really loud and I feel uncomfortable while using for brows because of this only.. 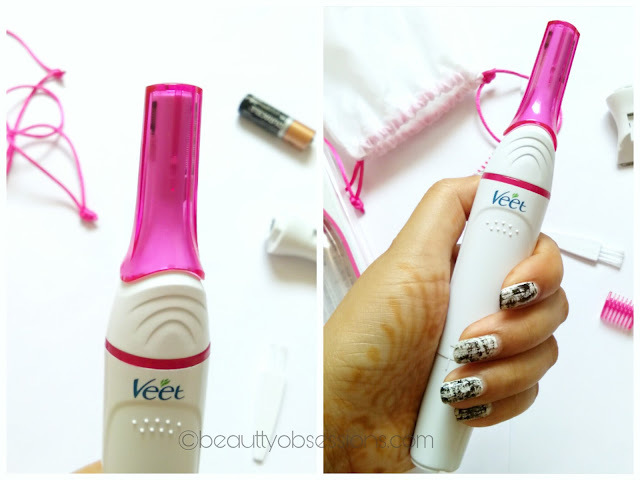 I wish it is noiseless..
😊 Works perfectly on face, upperlips and underarms..
Hope you found this review helpful... Do share your thought in comments below..
Nice detailing. I was thinking of something like it. Thanks for sharing. just drooling over the pictures. Nice review. But it is indeed bit expensive. Hi! Thats a very helpful review dear! I was contemplating whether to buy it or not but now that i know its not too good, am sure to hit the parlour soon! Personally, I don't like trimmers for the face, because the hair feels blunt. Your review is really good!